Magnus Walker's Car For Sale! How Much Did his Porsche Sell For? 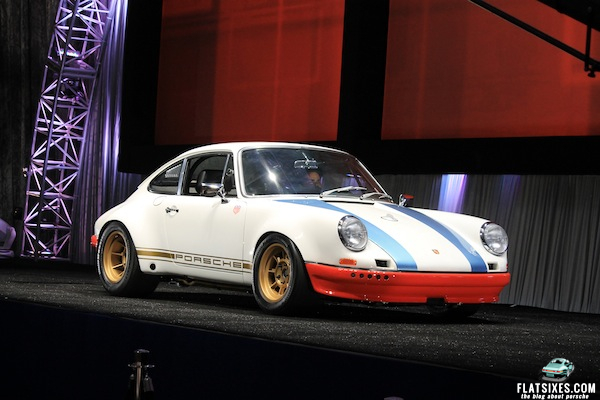 In late July we broke the news that Magnus Walker would be offering his beloved 1972 911 T known as "STR II" for sale during the Gooding & Company auction in Pebble Beach. When the Porsche was first listed by Gooding it was shown as being sold with no reserve and had a pre-auction estimate of $125,000 to $150,000. Some thought selling without a reserve was crazy and perhaps it might have been if things had gone differently, but it wasn't and they didn't. While Magnus has been doing what he does with Porsches for years now he first burst into the limelight with the release of his documentary "Urban Outlaw". From there, the trajectory of his Porsche celebrity went vertical. He (or his cars) have been on the cover of Road & Track and Total 911, He's been seen in and around all of the biggest Porsche shows, Jay Leno had him on "Jay Leno's Garage" not once, but twice, we most recently saw him on "The World's Fastest Car Show" with Justin Bell and there's an upcoming feature on Magnus in this season's Top Gear USA. So, it's no wonder that when the bidding started last night around 9:15 pst that it quickly surpassed anyone's expectations (except maybe ours) and hammered sold at $275,000 ($302,500 with buyers premium). The bar has been set for this new/old breed of tuned Porsches and the creations coming out of Magnus' shop. It should be interesting to see what happens from here.